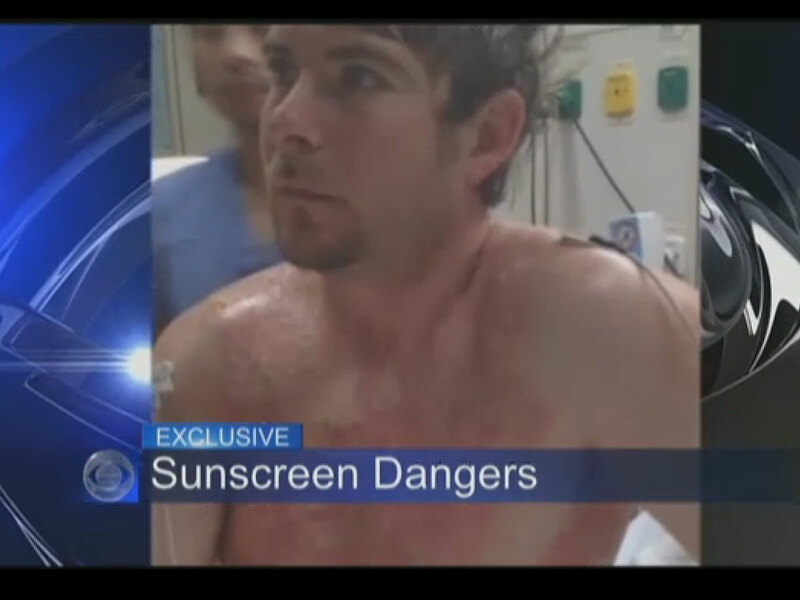 (CBS News) Sunscreens are supposed to protect people from getting burned. After applying Banana Boat Sport Performance spray-on sunscreen before barbecuing, Brett Sigworth's body caught on fire. "I sprayed on the spray-on sunscreen, and then rubbed it on for a few seconds. I walked over to my grill, took one of the holders to move some of the charcoal briquettes around and all of a sudden it just went up my arm," Brett Sigworth of Stow, Mass., told CBS Boston. "I went into complete panic mode and screamed," he said. "I've never experienced pain like that in my life." Sigworth's friends and girlfriend helped put out the flames and saved his life. He got second degree burns on his chest, ear and back that correspond with the lines where he applied sunscreen. The worst of the burns are around his neck, and his skin is still healing since the incident that took place about two weeks ago. Doctors said if the man was on fire for only a few seconds more the burns would have been more severe. "There is no warning that says this product is flammable when applied to your skin or for a period of time when applied to skin," Sigworth said. "I think if people were told this is flammable for two minutes on your skin afterward, people wouldn't use it." The warnings state the spray is flammable and to not use near heat or open flame, but doesn't address once the product is applied. "We were concerned to hear about Brett's experience," the company said in the statement to CBS Boston. "At Banana Boat, we take these matters very seriously and will begin a prompt investigation as we continue to strive to deliver products of the highest quality to our consumers." Inspector Quvondo Johnson from the Los Angeles County Fire Department, told CBS Los Angeles his department has received calls from similar incidents because aerosols contain propellants, or flammable gasses in them. "If it's an open flame, it will ignite whether it's on your skin, whether it's on your clothes, whether it's in the air," he said. Johnson advises to heed the label and to perhaps choose lotion sunscreens if you're going to be near an open flame.